Plans are under way for our fabluous roof garden. Thank you so much for all your comments and suggestions they have been wonderfully useful. Yup, that’s all we got a stray plant growing between the cracks on the balcony railing. 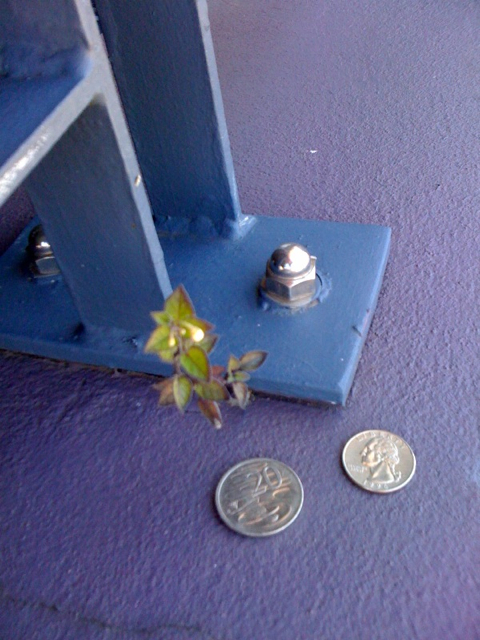 The twenty cent piece and quarter are there for scale. It is teeny tiny. I shall keep you posted with more pictures as the garden grows. It will be a slow process because we’re having large wooden troughs made to house the profusion of plants I’m determined to have. But it will be wondrous! Oh, yes, it will. What sort of shade solution did you have in mind? But you’ll nuture your first little baby won’t you. He’s so cute and looking about to flower. ClareSnow: In my previous post on the subject there was some plants that prefer shade that I mentioned. I think that’s what Sean’s referring to. There are indeed Aussie plants that need shade. But you are correct the vast majority don’t and there the ones we’ll be going with. 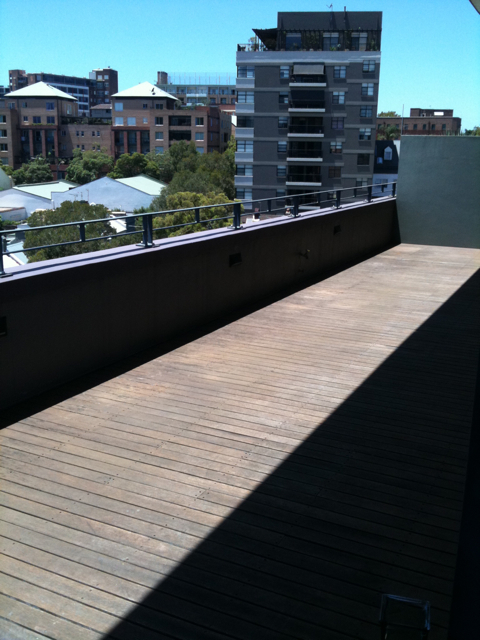 Cause as you can see they’ll get precious little shade on our balcony. Actually that plant is already in flower. That’s what the white blurs are. I was thinking that you might need some shade cloth to help some of them establish themselves. I have some Mallee eucalyptus in pots. Have had them under shade for 2 months, prior to a planned planting in autumn. Lost two when I had them in full sun.